No GoPro camera purchase would be complete without some accessories. 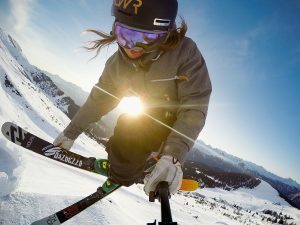 You’d be surprised at all the amazing ways you can use a GoPro camera, but not without the accessories that can make it happen. 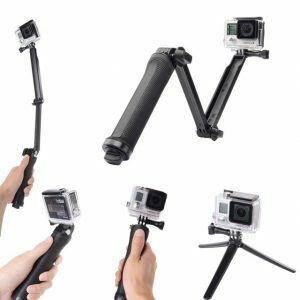 The tripods we’re showcasing in this article are just a few of the available GoPro camera accessories for sale these days. Tripods are also useful for continuous monitoring of a specific location. This camera and tripod can be controlled and adjusted in person, or remotely with a remote control. The three legs of the tripod and mounting bracket provide the camera with a stable, portable surface that can be assembled and disassembled in minutes. This makes transferring your tripod and camera to a new location easy to accomplish. You might not be aware of it, but there’s also monopods, in addition to tripods, available for sale. A monopod features just a single leg, and is MUCH cheaper to purchase than a tripod. Tripods are, on average, about 3X as expensive as a monopod. This article focuses specifically on tripods, not monopods. Below, you’ll find our picks for the top 3 tripods for GoPro cameras on Amazon. The best all-around tripod, best tripod for the money, and the best tripod on a budget. This is considered by us the best GoPro tripod on the market! Many of the best camera accessories are ones that can be taken apart and used interchangeably, as in, each piece able to serve an individual purpose. This kind of functionality saves consumers a lot of money, mainly because they don’t have to buy stand-alone accessories that end up costing a lot more. The GoPro 3-Way Grip, Arm, Tripod (GoPro Official Mount) is one of these interchangeable products. And since it’s officially licensed by GoPro, you know you’re getting a high quality tripod that works seamlessly with your GoPro camera. There’s not many tripods in the marketplace designed like the GoPro 3-Way. The unique feature set, functionality, and high performance makes it our top pick for best all-around tripod. The AmazonBasics 60-Inch Lightweight Tripod with Bag gets our pick for the best GoPro tripod for the money. While it isn’t the cheapest, and doesn’t come with the VERY best features, it’s still a very good mid-class tripod with enough features to keep amateurs busy and experienced photographers satisfied. Unlike the 3-Way GoPro tripod above, the AmazonBasics 60-Inch Lightweight Tripod is simply a full sized classic tripod. It includes a 3 way head and 2 bubble view levels that make landscape and portrait photography easy. It also comes with adjustable height legs, rubber feet, and a quick release mounting plate for easy camera switching. It weighs only 3.3 lbs, and can support a total of 6.6 lbs in load weight. It’s got tons of quality features, and we think it’s the best overall “bang for the buck” in the GoPro tripod market. 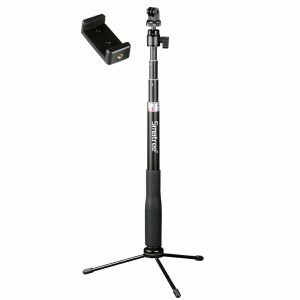 While the monopod pole design of the Smatree SmaPole Q3 might fool you at a glance, once you see the three tripod legs, you’ll realize this is indeed a tripod and not a monopod. This telescoping Selfie Stick tripod comes apart and is cross-compatible with any center pole that uses a 1/4″ thread. It’s one heck of a deal for the money, and it comes with a slew of features that go above and beyond what basic tripods offer, so we’re happy we found it. For example, the universal compatibility of the parts allow usage with not just GoPro cameras, but any camera that uses a 1/4″ thread. It also works with cell phones! The 360 degree flexible ball head and adjustable height allows you to adjust it to conform to any angle you want. When you combine all these great features with the highly affordable price tag, we think it’s the best value for people on a budget. Tripods are especially useful for home security/surveillance purposes. Outdoor weather can dislodge and break your camera easily. So, in order to “lock in” your camera, and provide legs that can be anchored down on a stable surface, you need a tripod. Tripods are especially useful for capturing photographs or video on shaky surfaces. They steady cameras so images come out crystal clear instead of jagged and blurry. Close-up image quality is also greatly improved. You’ll find that a tripod delivers nearly perfect up-close images with stunning clarity. Tripods are great for vacation film footage as well. Take 4 X 4 adventuring in a Jeep, for example. By hand, you’d be swaying and jostling with the camera while trying to make a good film. But with a tripod, you can simply bolt the legs of the tripod to the top of the Jeep, turn the camera on, and that’s it! Camera panning is another area where tripods are useful. You can pan a camera manually, but the human hand can’t come anywhere close to the fluid movement of a tripod head. Tripod heads pan smooth and error-free, thanks to the included bearings. And cheap tripods work great for functionality on a limited budget. It may not come with lots of “bells and whistles”, but super-cheap tripods can provide you with bare minimum functionality. And if all you need is basic features, you’re good to go for a bargain price. Tripods aren’t “locked in” to holding just cameras either. They can hold flash units, slaves, camcorders, reflectors, and pretty much anything else you can hold down with clamp levers and flip-locks. Of course, more expensive tripods with tougher housings can hold heavier items and do so more dependably than flimsy/cheap tripods. Now, if you’re just beginning with tripods, here’s a great tip. Series of images, like panoramas and montages, are where tripods reign supreme. When trying to collect high volumes of images, such as for surveying land for geological changes, tripods are essential. Lastly, if you want to get the most from your tripod, learn how to use it correctly. Many beginners make the mistake of simply putting the camera on the tripod, setting it down, and expecting the “magic” to happen. Tripods don’t work that way. They require you to use finesse and adjustment to get the most from them. Using low height when you can for better outdoor wind stability is one such example. Another is to adjust the height of the legs before spreading them to ensure they’re dialed in at the same height. Which means less chance of wobble. And the list of reasons to own a tripod continues. Tripods can help to steady cameras in low light conditions when shutter speed is slower. 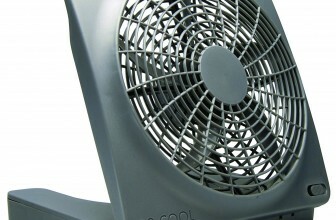 Slow shutter speed creates vibration that can result in image blurring. But with a tripod, there’s much less vibration going on. Your Choice Of Head – You can choose from geared heads, 3 way permanent pan-tilt heads, fluid heads, and more. The head of your tripod has a lot to do with the final quality of your shots. Nearly everything about tripod photography comes down to the accessories that you can use along WITH the tripod. Extendable Arms/Legs – If you need the functionality, you can find some tripods that have arms that extend and pivot. Extendable arms allows you to position the arm for a more precise camera angle. Many tripod legs can be adjusted to custom height levels as well. Center Extension Pole – Adjustable height in photography is important. Without height adjustment, you’d find that you’ll be very limited with the pictures you can get. Having to angle your camera up may not provide the best picture results, so an adjustable center extension pole is a great solution. This is especially useful when filming objects prone to glare. Waterproof Housing – Tripods are almost always used outside, so it makes the most sense to use a waterproof housing. Considering the amount of outdoor exposure to the elements a tripod goes through in its lifetime, continuous protection from moisture rot and flaking is great! Flip-Locks / Clamp Levers – Flip-locks and clamp levers are the best way to lock down accessories onto your tripod base. While they can’t hold an extreme amount of weight, they’re very versatile. WIth multiple flip-locks/clamp levers, you can create some pretty awesome setups. Built-In Level – Your tripod should come with a built-in leveling system for automatic self-righting photo sessions. There are aftermarket levels you can purchase that offer more precise leveling, such as 3-axis leveling, bubble leveling, and spirit leveling. Universally Compatible With Different Camera Types- GoPro is a bit of an expensive camera choice. So, in order to save the most money, you should try to find a tripod that can be used universally with cheaper cameras than the GoPro. This way, you can mix and match your tripod assembly, use cheaper cameras when you need to, and not have to be buying new equipment constantly. Lightweight And Stable – Most tripods are lightweight enough to be highly portable. Around 3-6 lbs is about the norm for most tripod setups, and to give you a better idea, a 3 lb tripod can will usually hold about 6-7 lbs of weight. Made From High Quality Materials – To get the best deal for your money, you should make sure your tripod is made from quality materials like titanium, aircraft aluminum, crack resistant plastic, etc. It wouldn’t make sense to buy a tripod if it’s going to rust or degrade prematurely. Although it costs more than nearly all other GoPro tripod options out there, the GoPro 3 Way has an exceptional feature set and build quality other tripods can’t match. While other tripods simply stand up straight with legs that fold up close to each other, the GoPro 3 Way is much more angleable right out of the box. In fact, the 3 Way saves you the trouble of having to purchase a stand-alone extension arm. One small complaint about this tripod is that it’s kind of flimsy, and doesn’t do very well in high wind conditions. However, this problem is easily remedied with a few pieces of weight (hand-sized sandbags, rice bags, etc.) held down with flip-locks or clamp levers. Dual Purpose Handle And Tripod Compartment – The handle on the GoPro 3-Way can be used as a lightweight camera grip, or as a part of the tripod assembly. Inside the the handle is a tripod compartment where you can conveniently store the tripod out of harms way. Extension Arm – The extension arm provides additional length to the tripod as well as pivoting/angling ability. You’ll notice that the “joints” of the GoPro 3 Way extension arm are tight enough to hold their position in turbulent conditions, but also easy to adjust. Universal Mini-Tripod – One of the greatest things about this tripod is the universal compatibility with aftermarket monpod and tripod center poles. 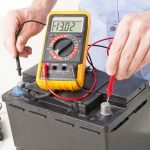 As long as the pole you’re considering uses a 1/4″ thread, it can be universally “swapped out” with other poles that use a 1/4″ thread as well. 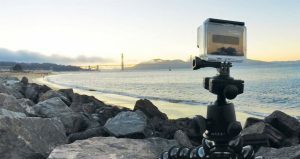 Waterproof Housing – Using tripods for outdoor photography is very common, so to ensure proper functioning of the tripod, the GoPro 3 Way comes with a waterproof finish. It’s completely sealed away from the damaging effects of rain, snow, mud, ice, etc. Perfect For A Wide Variety Of Photography – Whether it’s selfies, POV, follow cam footage, static tripod shots, and more, you can count on GoPro to deliver a high quality photo taking experience. The folding arm allows you to extend it straight up, so you can capture selfie shots without the mount getting in the way. 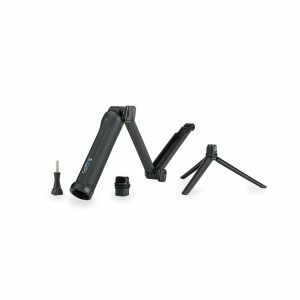 Compatible With All GoPro Cameras – Other tripod packages might only offer questionable compatibility with the full line of GoPro cameras, but the GoPro 3 Way is guaranteed to be 100% compatible with every GoPro camera out there. There’s a variety of situations where the design of this tripod will be more appropriate than a standard tripod. For example, if needing to film at an angle in the woods, a distance away, with the camera eye focused between between two trees (narrow space), you’d see how this tripod can help. Where a normal tripod would fail by not offering angleability on the tripod head, the 3 Way GoPro allows you to tilt and adjust the angle using the swivel joints. 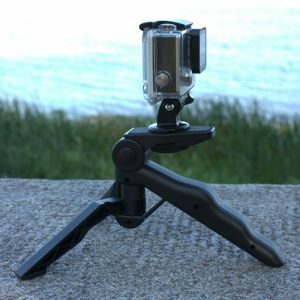 The GoPro 3 Way Grip, Arm, Tripod (GoPro Official Mount) is one of the only available tripods that offers precise angling! If you’re looking for the best value in the tripod industry, the AmazonBasics 60″ tripod, 100% owned and produced by Amazon LLC., is one of the best out there. In fact, we chose it as our #1 pick! It comes with all the tripod features people want most at an honestly affordable price. Remember that Amazon LLC is a fairly new online marketplace, so they’re doing everything they can to expand and improve business operations to become bigger and better! 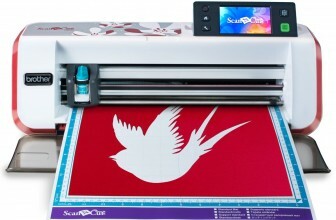 And that includes special deals on products they produce to attract new customers. This is one of those awesome deals. Adjustable Height Legs – The legs of the AmazonBasics 60-Inch can be extended between 20″ and 48″, and measures 60″ from the top when fully assembled. Rubber Feet – Especially on wet surfaces, the rubber feet keep your tripod steady and free from slippage. Universal Camera Compatibility – You get an added element of value with this tripod because you can use it with nearly every camera design out there. If it’s a fairly recent digital camera, more than likely it will be compatible with this tripod. Quick Release Mounting Plate – Swapping cameras “on the fly” is easy with the AmazonBasics 60-Inch Tripod. Simply depress the lever, and swap a different camera into the bay in seconds. Built-In Bubble Levels (x2) – There’s one level above the legs and another on the top of the camera plate. Dual level functionality gives you two ways to make sure your camera is level at all times. 3-Way Tripod Head – Portrait and landscape pictures are no problem for this tripod, thanks to the 3 way head that can swivel and tilt for the best possible angle. Zippered Carrying Case – Transport is easy too. After being folded up in the bag, it’s totally compact and ready for travel. 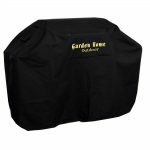 6.6 Lb Weight Capacity – The 6.6 lb weight capacity allows you to do plenty of accessorizing with flip-locks and clamp levers, or weight the tripod down with sandbags or etc. in rough weather conditions. Most people that work a normal job with a normal salary are always trying to find the best deals. 99% of us do that. Build savings up, experience great products, and get the peace of mind of an affordable purchase. The AmazonBasics 60″ Tripod is one of these products. It doesn’t come with a bunch of super expensive features that only extreme professionals need. It comes with everything that your average photographer needs from a tripod. It’s the perfect tripod for people that want to save the most, but get the most tripod they can for the money. For people trying to save the absolute most, the Smatree Q3 is a logical choice. But with the cheap price tag, comes the sacrifice of a less durable housing. People who are wanting to use this tripod/selfie stick in rough outdoor weather will be disappointed by the thinner design of the tripod and pole. But for indoor photo connoisseurs, it’s an affordable choice that will work well. As long as you don’t expect it to stand up to being clamped down with loads of weights, you should be just fine. We know there’s lots of people who don’t need the ruggedness of outdoor designed tripods, and simply need a super-cheap option for indoor photography. For indoors, this tripod is perfect. 1/4″ Thread Universal Ball Head – Provides a full 360 degrees of movement. Fits both GoPro and Ricoh cameras, as well as cell phones. The 1/4″ thread will also fit aftermarket camera options that use 1/4″ threading. Adjustable Height Selfie Stick – You can adjust the Selfie Stick pole from 11.8″to 36.6″ of height. The selfie stick also features slip resistant rubber housing and a wrist strap for “on the go” functionality. High Quality Aluminum Construction – Smatree is producing some truly high quality tripod setups these days. Make no mistake, the high quality aluminum tube construction will last for many years of trouble free use under normal conditions. 1/4″ Thread Universal Tripod – If you ever want to use your tripod with other 1/4″ thread poles or assemblies, no problem! The universally recognized 1/4″ thread will fit seamlessly with your choice of aftermarket poles. Foldable And Compact – When your photo sessions are over, and it’s time to store the Q3 away, it folds up neat and compact. You can travel with the small space footprint easily, and it doesn’t take up much storage space either. It requires only about a foot in length, and about half a foot in width, that’s it! Although it would go against the warranty and possibly void it, don’t forget that in extreme situations or an emergency you COULD choose to custom alter this tripod to be stronger and more able to withstand outdoor conditions. Spot welding additional aluminum to the base or using custom additions to strengthen the tripod legs is doable, but might end up reducing the lifespan of the tripod if used roughly for long periods of time. 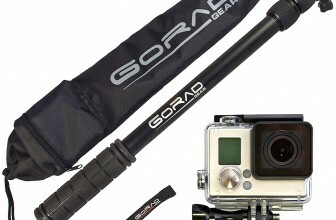 In addition to GoPro Tripods, there’s also a world of accessories to go WITH tripods. For example, remote control setups allows you to adjust the angle of the camera from a distance away. The tripod setup comes with a remote and motor to attach to the camera. Another good example is a GoPro Tripod mount. It allows you to use any standard tripod to mount your GoPro camera to. Usually, proprietary GoPro tripods carrying the GoPro brand name are much more expensive than aftermarket retailer tripods. The GoPro Tripod Mount only costs a couple dollars and can save you a lot. You can also hook a lanyard or wrist strap to the included loophole on the bottom for convenience. Tripods come in many different shapes and sizes. There’s no one-size-fits-all option out there, so you should try to find one that offers the greatest number of features you need. However, it’s financially smarter to consider the aftermarket accessories that can provide the functionality, rather than demand the tripod come with what you need built in. Aftermarket accessory shopping can save you a lot of money in the long run. And keep in mind that the right tripod for you might be one with angleable legs. Think legs similar to the Snake Light by Black and Decker. Like the Snake Light, the legs of certain tripods can be adjusted to sit stationary and “bent” into any angle you want. And you can find some real bargains with bendable leg tripods. Some of them are only a few dollars each! GoPro tripods are certainly taking the camera and video industry by storm. But don’t forget there’s also tons of other great aftermarket products you can use along with your new tripod to bring your photo taking to new heights. Such as flex mounts, microphone mounts, and more! And when it comes to tripods for your GoPro, there’s no “one size fits all” option. There’s many different features/options that certain tripods come with that other tripods don’t have. So with tripods, it’s not so much about the price, but more about the features they come with. Just because it’s expensive, doesn’t mean that it’s going to serve your needs correctly, and vice-versa. A tripod that costs only a couple dollars might have the features you need, while a more expensive one might not. Point being, never base a tripod purchase around price alone. Make sure to closely examine the feature set, and try to match it up to the situations/environment you’ll be using it in.